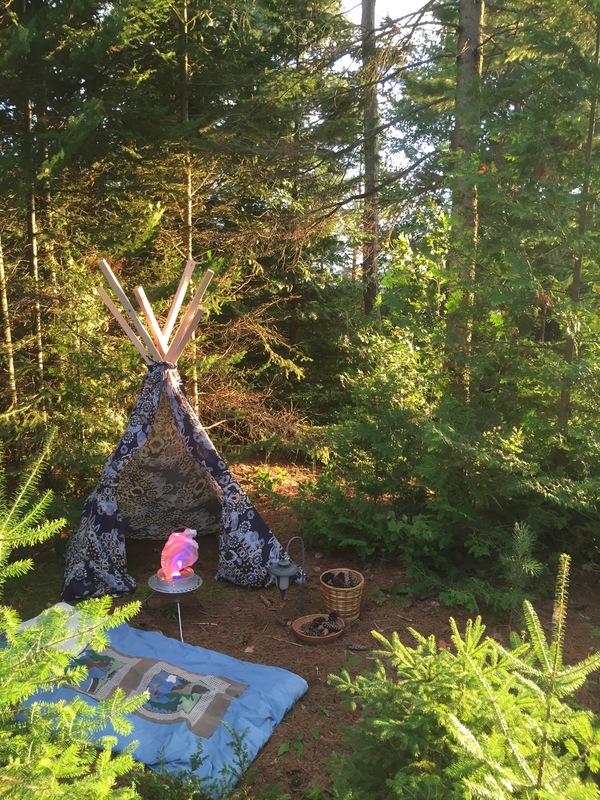 Just a quick post today where I’ll show you an adorable little campsite and teepee in a cozy little nook I set up last week for the kids to play in. This little clearing in the wooded area outside my family’s cottage was the perfect spot to set up camp. 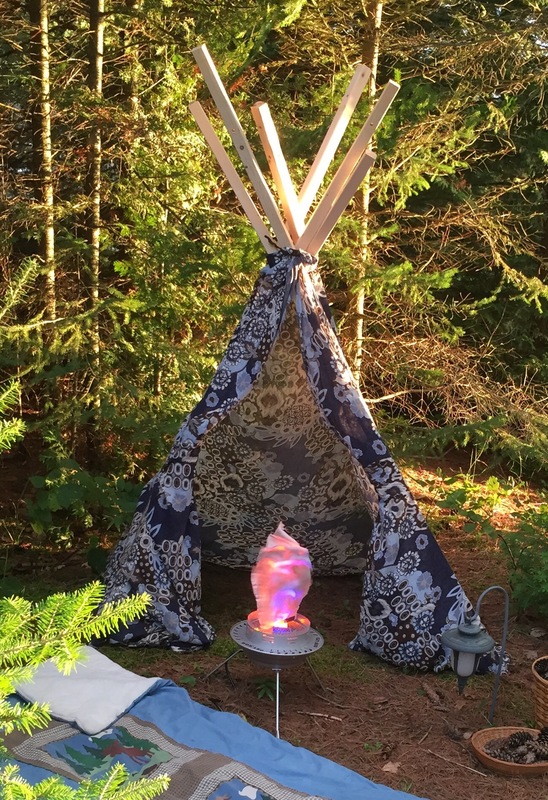 The play teepee was made using 2×2 pine boards, some fabric that was on clearance and some rope. I drilled a hole in each of the boards about 18-24 inches from the top. Then, I set the up the poles in a teepee shape and looped the rope through all the holes and tied it tightly. 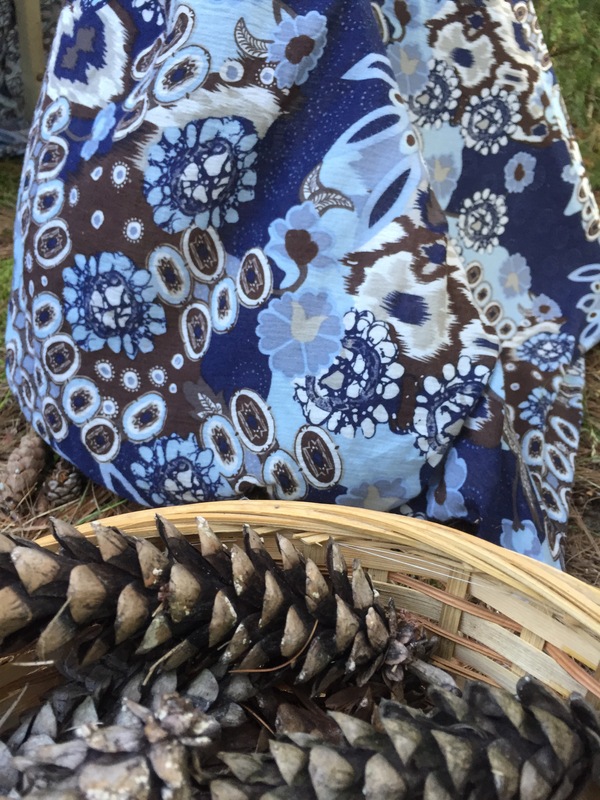 The ikat fabric was perfect for this teepee, and was on sale at $2.00 a yard. I bought 2.5 yards, cut it in half and then sewed the larger ends together. This was more than enough fabric to cover the whole teepee. I simply wrapped it around the teepee and adjusted it as needed. 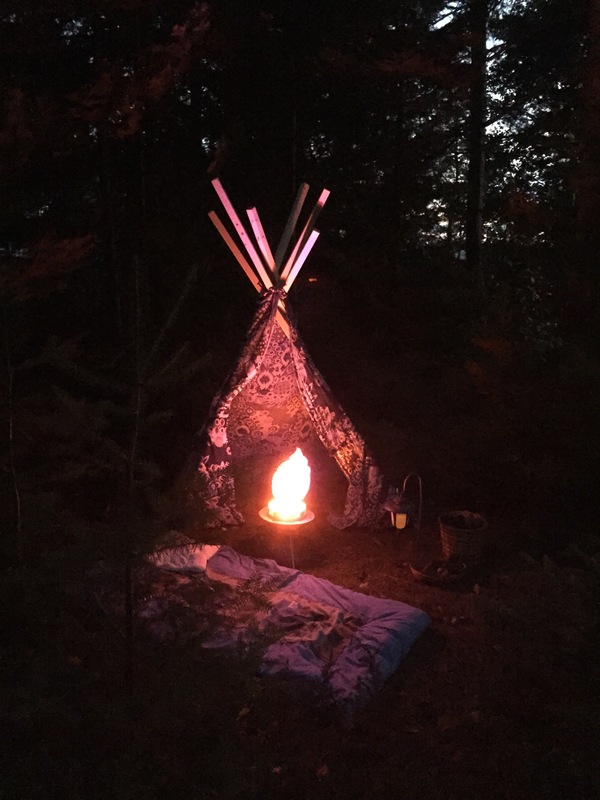 I also tucked it into the top of the teepee, so that it wouldn’t move around too much. 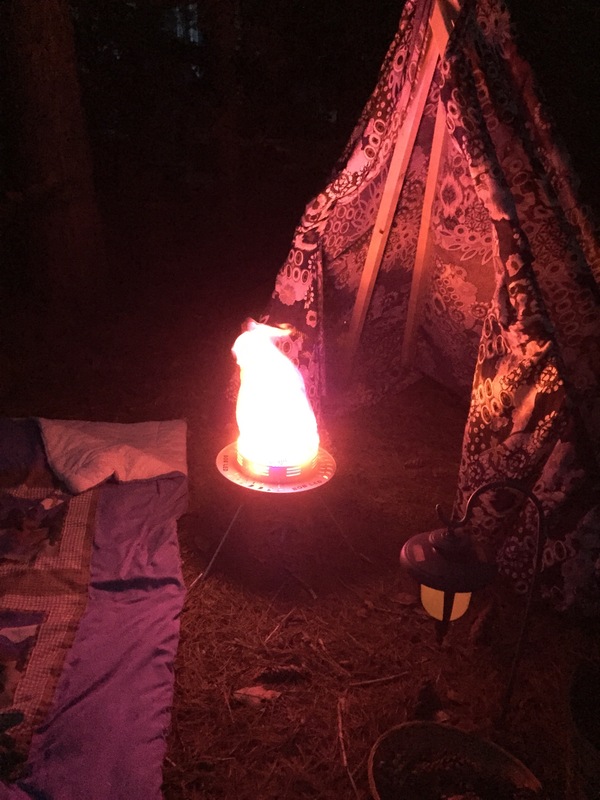 This adorable faux fire is by far my favourite thing about this campsite. It is powered by a plug in cord, and it has a fan and LED lights in the centre. 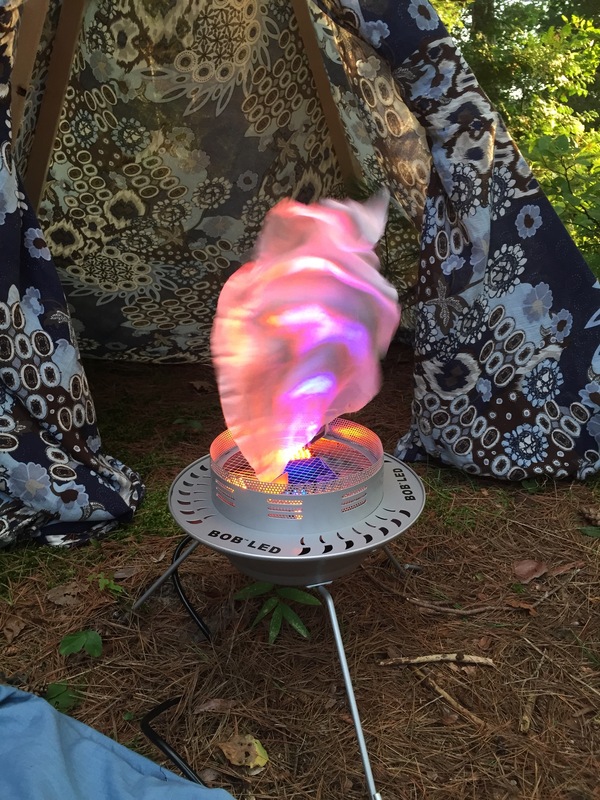 The “fire” is white silk that gets blown around by the fan and lights up. It really looks like a real fire when it’s turned on. Here is the campsite at night. The faux fire looks AMAZING!!! These pictures don’t do it justice. It was a lot of fun to set up this cool little play zone for the kids, and they had fun pretending to camp. 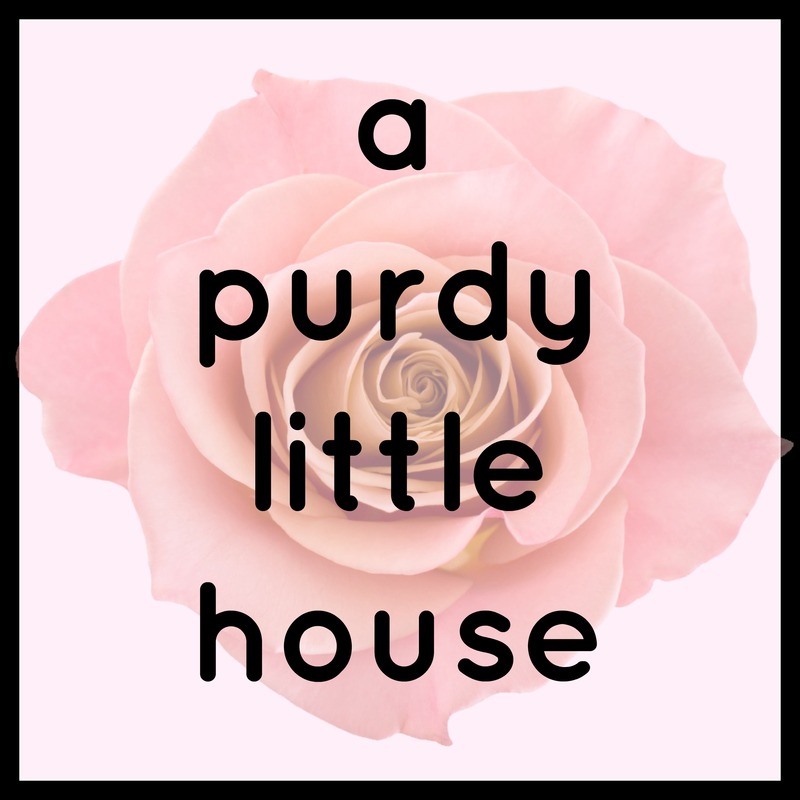 Or by subscribing by email on the upper right hand side (on your monitor, or at the bottom of this page on your smartphone). When you subscribe by email, you’ll receive an email notification whenever a new post is published.